Here are pictures and measurements for making a weather station. 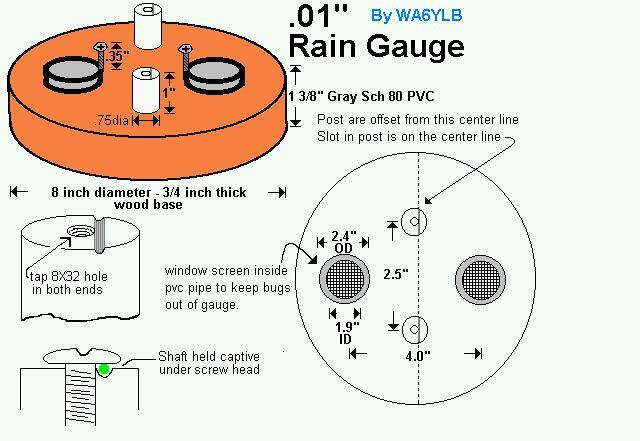 Shown first is the rain gauge, which is compatible with a Peet Bros Weather station and I currently have one of these attached to a West Marine's Weather Base 10 (relabeled Peet Bros station). This is the top to the rain gauge. Its made from about 12.5 inches of 8 inch schedule 40 PVC pipe which has an ID of 8 inches. Inside of it is a "Blitz MFG co." or "Rubber Queen" 8 inch funnel, which I purchased at a local Kragens Auto store, an auto part store here in central California. I mounted the funnel about 2 to 2 1/2 inches down from the top. I hot glued the funnel into position, making a smooth transition from the sides of the PVC pipe into the funnel. I had to trim off the funnel hangup hole on the edge of the funnel to get it to slip into the PVC pipe. Above is a view of the inside mechanical workings. 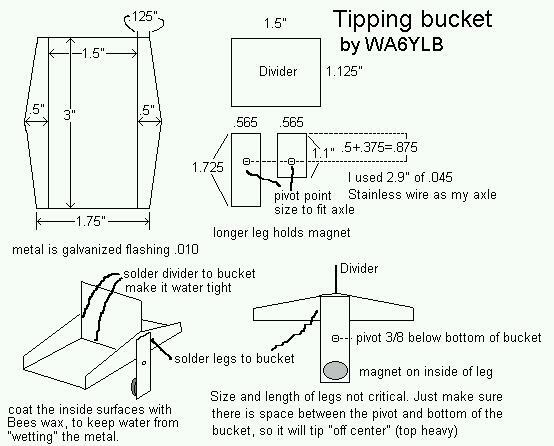 The tipping bucket is made of galvanized flashing (.010), which is available at most hardware stores. I bent the bottom piece, and soldered in the center divider. 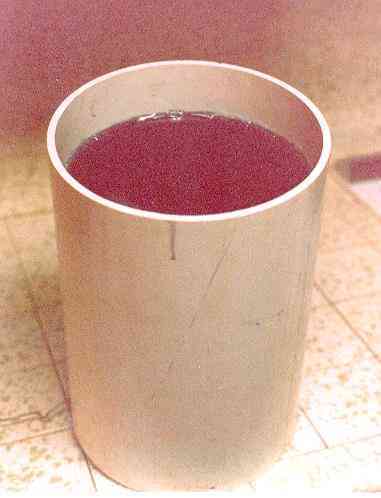 The dimensions for the base and the tipping bucket are shown here. This bucket is adjusted by putting a certain amount of water on one side, and the weight of the water makes it "tip" thus releasing the water, and trigger a "count" to the computer. What you cant see in this photo is a coating of bee's wax on the the metal insides of the bucket. When I first built this "bucket", I found that water would "stick" to the metal thus causing the calibration to be "off". To calibrate the rain gauge, the base assembly is leveled, and 8.26 cc's of water is applyed into the side of the bucket that is up. [Note - the value of 8.26 cc's of water is determined by taking the volume of the Inside Diameter, figuring the volume for 1 inch high, then dividing by 100 ( for a 1/100 of an inch calibration) - then I converted the cubic inches into cubic centimeters and found the volume amount. You can recalculate to whatever size you make yours. I did hear that the 8 inch is a standard weather service size. I have yet to confirm this .] Then the screw on the side of the bucket opposite the "up" side is adjusted so the bucket just tips over when the last drop is added to the bucket. The dark PVC tubes are for letting the water "out" of the rain gauge, and to hold the calibration screw for both sides of the tipping bucket. Inside the PVC tubes, window screen is installed to keep bugs from crawling in. 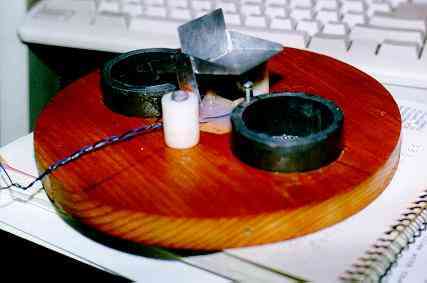 Soldered to one side of the bucket is a arm, with a magnet on it. I cut the windings off a reed relay, and mounted a reed in its relay bobbin between the two water exhaust PVC pipes. 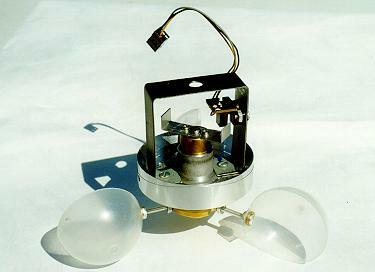 The reed, inside the bobbin,is mounted in the middle, so that the magnet causes the reed make a "contact" closure when the bucket tips. Be careful to make sure the reed isnt closed when the bucket is tipped and resting on an adjustment screw. The reed should only close when its close to the middle position (balanced between both adjustment screws. The full size graphics art film image is about 1.5 inches in diameter. Here is a quick view of the wind direction film I used in making up the 16 position direction sensor. The format is pure binary, but I need to warn you - two of the tracks (track value of 2 and 8) in the above picture are 180 degrees from where you would expect them to be. The outside track has a binary position of 1, followed by 2, 4 and the center track is 8. The reason my pattern as shown here is skewed, is that I couldnt get my 4 sensors next to each other in the space I had available in the sensor module. If I were to construct the sensor from scratch, I'd put all four sensors in a line, on one side of the shaft. For this direction sensor, 0000 (0 hex) is North, 0100 (4 hex) is East, ending with NNW as 1111 (f hex). When Virgil, AC6KT, made his direction pointer, he laid out the binary pattern on clear mylar and stuffed it into a clear plastic pill bottle. The pill bottle is connected to the direction shaft, and LED's shown through the bottle and mylar. My direction encoder started life as a print head position sensor from an old Northern Telecomm dot matrix printer. It had an 1/8" shaft, that turned a plastic puck with slots in it inside the module. Infrared LEDs shined thru the slots in the plastic puck. The problem I had reusing the original puck was the number of slots in the puck would not align up with 16 evenly divided directions. So I made a 4x (or 8x) drawing of what I needed, and had it photo reduced and put on Graphic Artist film at the 1X size, which looks like the above photo. Check with some of the copy places in town - some can do this for a small fee - I have also had newspaper print shops do this for me too!) Note: I have heard back from another interested user that told me of a gray encoding method for the optical disk that would help with this project. I will post the results here when I obtain permission from him to post that information. I made a small aluminum top hat to hold the film to the direction pointer shaft with a set screw. The original shaft in this printer position module rode on two ball bearings. After noticing my wind direction assembly operate, it became obvious that the two bearings allowed the wind direction to rotate too freely. (a slight gust of wind would cause the pointer to rotate more than once around! I then added drag to the main shaft by having a piece of spring steel (such as a large safety pin) rub against the shaft. A small wind gust still causes the direction pointer to coast, but it tends to stop after only rotating a 1/4 to 1/2 revolution. I do plan on adding even more resistance, as I still think this is still too much rotational travel. Without adding drag, your wind direction will end up pointing in a random direction. My advice is to not to make the wind direction be so free. The shaft for the pointer was made from piece of 3/16 aluminum rod. I made a pointer on my lathe about 5/8 of an inch in diameter, with a 45 degree pointer on it. I held it on the pointer shaft with an 4-40 x 1/8 inch setscrew. The "tail" for this pointer came from a piece of .050 inch thick flat aluminum plate, with dimensions of approximatly 2 X 3 inches. Overall length of the pointer w/tail is about 10 inches. I also made a coupler to connect the 1/8 shaft of the optical encoder to the 3/16 shaft at a right angle . When this is assembled, turn the sensor on its side, and see if the pointer turns towards the ground. Slide the shaft back and forth as required to balance the pointer so that the point isnt heavier than the tail. I mounted a measuring cup up-side-down on top of the interface piece where the opto shaft meets the pointer shaft shield out rain. I then cut off the bottom of a spray can (canned AIR of course!) and pulled the crimped in valve assembly out of the top of the can. This serves as the rain shield for the opto assembly. I made a base out of UHMW plastic on my lathe, so that the bottom of the thin wall can slides onto it, and is held in place with a couple screws (4-40) - (I used UHMW because thats what I had around the place) I drilled and tapped a 1/4 - 20 hole in the center of this base for a mounting hole. I also drilled a small hole for the wires to penetrate the base. More photos and details about this sensor to appear here soon. 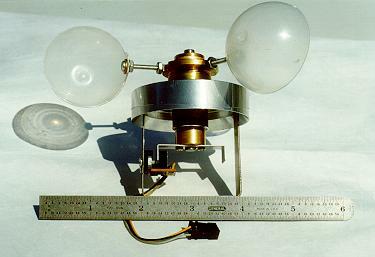 Here is a close up view of the wind anenometer. Here is the victim - a old VCR head! I then took it apart into the main three items. I discarded the motor part (green circuit board on the left). I only kept the center brass/bearings assembly. I then took the brass end off where the set screw is located, and exposed the two metric bearings. I pushed the shaft in one end, and if offset a bit, could use the center shaft to push the bearings out of the alumimum housing. I've been able to remove the bearings in several VCR heads without any problems. Wash these bearings in alcohol to get rid of the grease in them. I was able to place the two bearings in a small clean plastic pill bottle, with some alcohol and then drop the bottle with bearings inside, into an ultrasonic cleaner. Maybe you can get a jeweler to "buzz" your bottle with isopropyl Alcohol in it for you. Then I used some silicon spray, which is very thin. It was the kind in a spray bottle, like Silkon 35 by Chemtronics or simular. Try spraying a piece of paper to see if it leaves a heavy film of oil, or very light. The stuff I used made the paper appear "wet", but after it evaporized, it almost didnt leave any mark on the test paper. Dont reuse the S washers. You dont want any drag, when reassembling it. Notice the way its assembled when put back together. Here is a upside down view of the assembly put together. 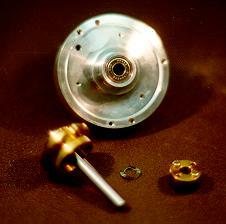 The lower shaft connects to the small brass piece, which holds the interrupter. The interrupter is from a old 360K disk drive. Surely you can find one of those!. Check old MFM hard drives (the full height kind). The cups are the bottom ends of "soft - frosted" toy vending machine cups. I have found that these will self destruct in sunlight after about 6 months. So, you may want to paint your cups to keep them out of direct sunlight. The clear crystal plastic ones are very hard to cut. I've only done this with nichrome wire. Anything else on these water clear cups tends to break them. The frosted ones feel like they have some flexability in them. These by far are the way to go. Here is a different view with a ruler. The screws holding the cups are 4-40 by about 1 inch. I drilled and tapped a 4-40 hole into the top brass part. After I made this unit up, as shown, I covered the entire assembly with an upside down soda can. This keeps the rain off the electronics, and keeps the sunlight off the sensor. When I first built a sensor, I couldnt figure out why some sunny days, the wasnt any wind readings when the cups were moving. Sunlight was shining into the sensor, even when I was using a brown pill bottle for the rain cover. This is why you need a light proof cover. I flattened out the domed bottom of a soda can, and cut a hole in it to pass the top brass part. The bottom of the cover was a circle of another can, cut in a circle,with the edge frayed, and bent up to meet inside of the top can. This keeps the bugs out of the anenometer. I made a small hole in the bottom of the can, along one edge to pass the wires out. 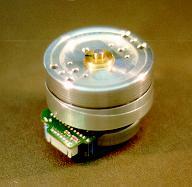 The interrupter is made up of a LED transmitter, and some kind of transistor "detector". Some of them have been wired up as three wires, some with four. Use a dropping resistor in series with the LED (470 ohm for 12V, 270 ohm - 330 ohm with 5 Volts). The output of this sensor is counted by the Lexor board. This design allows for two interrupts of the sensor per rev. Why? So I can tell if the sensor is "barely moving". So far, this hasnt been a problem, and the conversion table has this factored into it. Here is the source code for the Z80 based wx station. This code outputs data at 2400 baud in Peet Bros. UII format. The Z80 board I used was the main control board for a Lexor word processing system. I purchased a few of these boards from A to Z surplus in San Jose, a few years back. This software was written for that board, and will need to be changed for any other dedicated z80 board. I put the source code here so you could see what can be done, and you might enjoy building one yourself. Here is the Temperature lookup conversion table that goes in a separate 2732 socket.